Apple opened its first retail stores on May 19, 2001 - one in Virginia and the other in California. In the Steve Jobs biography, author Walter Isaacson wrote how Jobs had wanted Apple to have its own stores so that their iMacs didn't have to "sit on a shelf between a Dell and a Compaq while an uninformed clerk recited the specs of each". Despite initial criticisms and comparisons to Gateway's failed retail stores, Apple Stores not only continue to exist today, but are regarded as one of Apple’s greatest innovations - one that now contributes to more than 10% of Apple's revenue. I've previously written about the coverage of Apple's entertainment services in international markets (including how they compare to Google, Microsoft and Amazon), so I was similarly intrigued by how Apple's stores have expanded into countries outside the US. Whilst researching all this, I came across other questions such as whether Apple had a particular preference for when they opened new stores and how the expansion of their retail network would affect visitors and profits. What I have found isn't particularly groundbreaking, but there are certainly some trends and fascinating tidbits that I've come across, all of which is detailed below the break. A note to RSS readers: This article includes an HTML5 diagram that likely won't display in your reader, view this post in your browser (it works on iOS devices) to view that diagram. Apologies for the inconvenience. 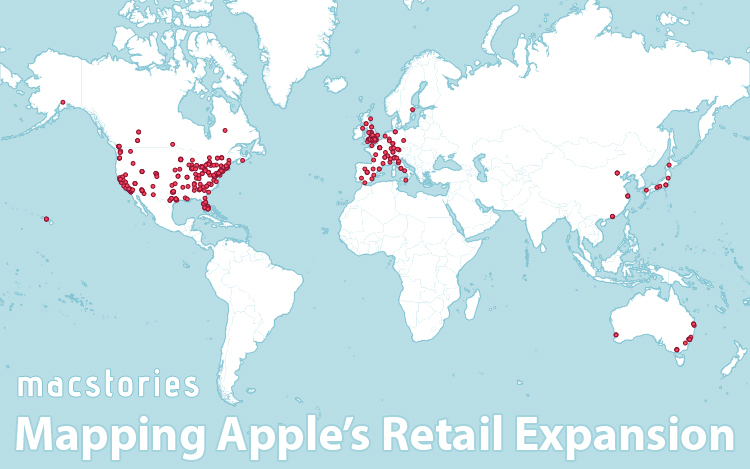 Below are two diagrams that really tell you the entire story of Apple's expansion into retail stores outside the US. 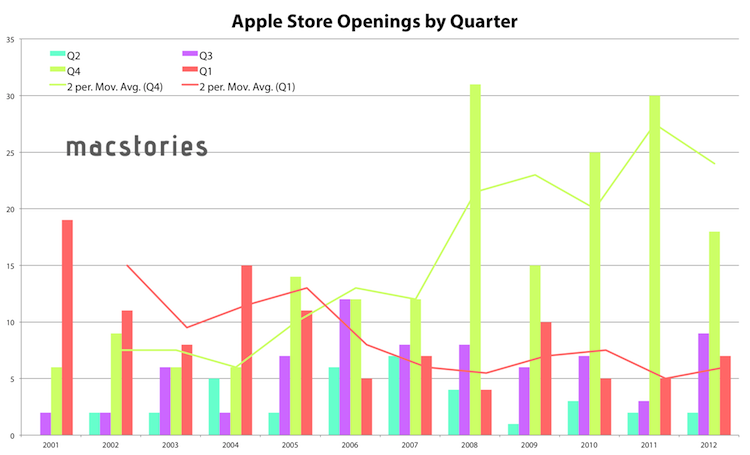 The first is interactive, allowing you to view every Apple Store that opened during each of Apple's fiscal quarters for the last 11 years up through Q1 2012, along with some statistics about that quarter. Note: When quarters are referenced they are fiscal quarters, when years are referenced, they are calendar years. So Q1 - 2011 is October, November and December of 2011. So to be totally clear every calendar year will start with fiscal Q2 then Q3, Q4 and finally Q1 and repeat. Apologies for the confusion here, this initially made most sense when I started researching but is now too difficult to alter without significant time. For the images, click to view them at a slightly larger size. This second diagram is a mix of two graphs representing the same data: a parallel sets diagram and then the familiar pie chart. 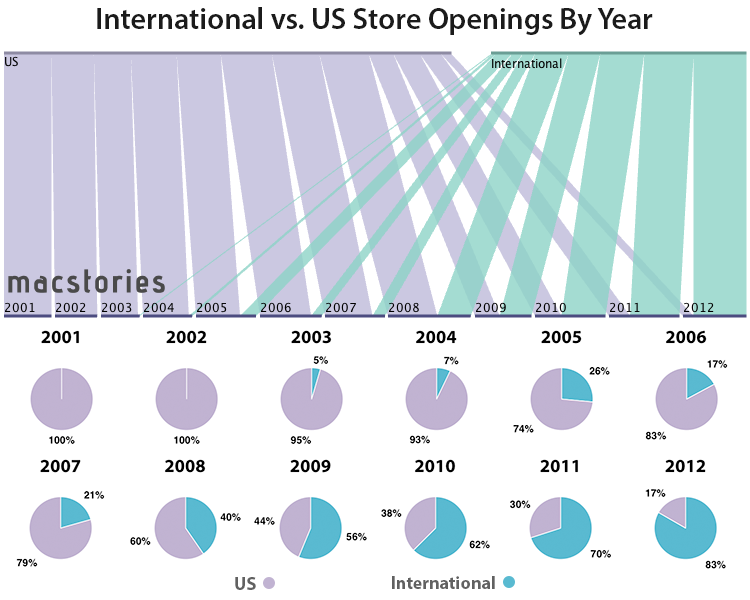 They both reveal the split between new US store openings and international store openings each year - not the total number of US vs international stores in each of those years. As you can see, in the early 2000s Apple was entirely focused on spreading their retail stores throughout the US, but as the decade wore on they slowly transitioned to opening less US stores and more international stores. They've done so because the US at this point is mostly saturated with 254 store openings and only six US states remain without an Apple Store: Montana, North Dakota, South Dakota, Vermont, West Virginia and Wyoming. In fact, a number of US states have more Apple Stores than some of the international countries - most notably California with its 52 store openings. The first international Apple Store was opened in Tokyo, Japan on the 30th of November, 2003. Japan was an early focus with it quickly getting 5 stores by the end of 2005, but after that the focus shifted to Europe and specifically, the UK. By 2009 more stores were being opened internationally than in the US and in the just finished 2012 fiscal year, 83% of new stores were located in international countries. Examining how many stores were opened each year, reveals that there hasn't been a great deal of variation in the number of new store openings. There is a general trend upward, but it's come in waves with more openings one year and then less the next year. The only year that really stands out is 2008 which saw a solid increase in store openings, to a total of 47. 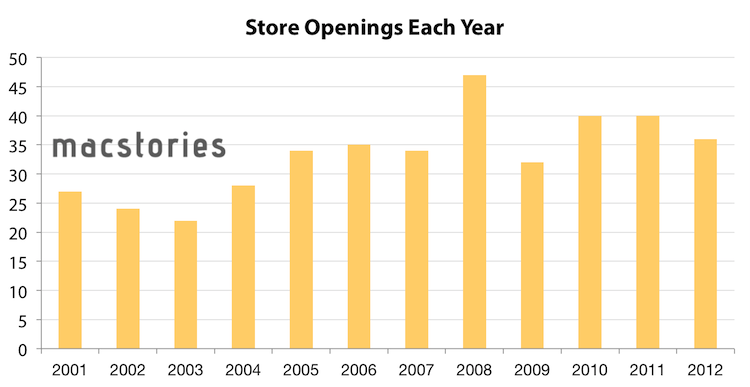 Compare 2001 (the first year, which actually only includes 3 quarters) with 27 openings and 2012 with 36 openings and you'll notice that the latter only saw 9 more store openings, even the "quietest" year, 2003, still had 22 store openings. This result surprised me - I had been under the assumption that there were only a few store openings in the initial years and that Apple had since drastically increased store openings, but that is only partially true - Apple has been opening more stores, but at a moderate pace. Also interesting was looking at how many stores were opened in each fiscal quarter. Here I saw that for the first few years, Q1 (remember, this is October, November and December) was the most frequent period to open stores, but that changed in 2005 to Q4 being the most frequent period to open stores and has been so ever since. The difference between store openings between Q4 and the other quarters is quite stark as well, with 46% of all stores (2001-2012) being opened during those three months of July, August and September. My guess would be that opening it during this period gives the staff time to settle in to the new store before the crazy Christmas season - and also time for consumers to be aware that an Apple Store is now open in that particular area. On the other hand, Q2 is the quietest period for store openings, with just 9% of new stores opening during that period - lining up with the post Christmas retail lull. Apple provides information on the profitability of the retail segment as well as the number of visitors to its retail stores. Connecting that to the number of stores that have opened and we can get approximate figures for profitability per store and visitors per store in any given quarter. 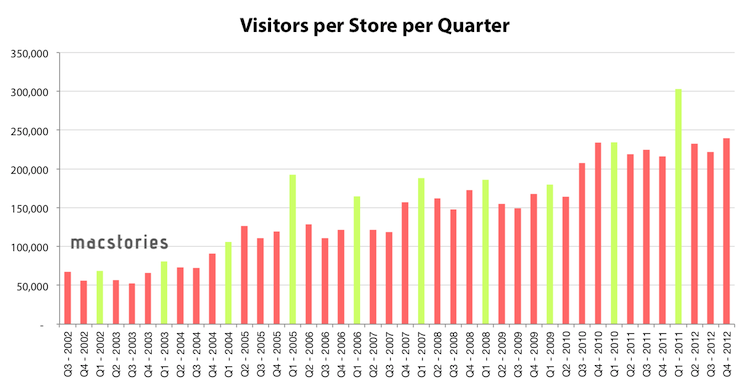 In terms of visitors per store, the first few quarters in which data is provided (Apple only started providing such data in Q3 2002) sees roughly 60,000 visitors per store. Quarter-to-quarter, these numbers vary but there is a roughly linear rate of growth on average with the last few quarters of 2012 averaging 230,000 visitors per store - or roughly 17,500 per week. In surprisingly, the Christmas Q1 sees a big spike in visitors every year, almost without fail. Moving to profitability and there's a much more drastic increase over the decade. 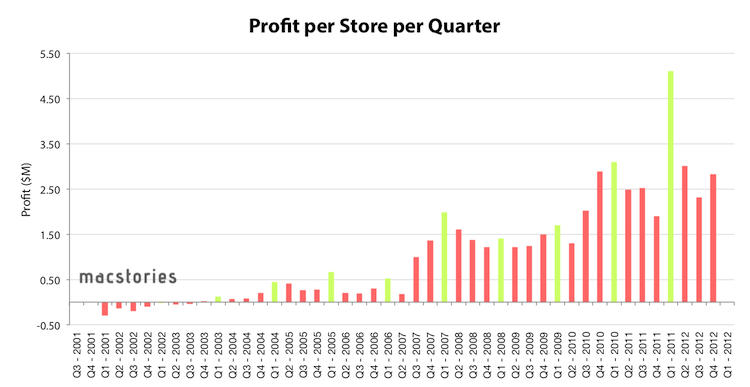 It took 10 quarters before Apple's retail venture became profitable, from there it was a fairly swift increase in profitability over the years, with recent quarters seeing 2 to 3 million in profit per store per quarter. Again, the Christmas Q1 quarter sees a huge spike in profitability per store - notably last years which saw a record 5.11 million per store for that quarter. Special thanks must go to Gary Allen and his terrific ifoAppleStore website. Without his meticulous documentation of Apple Stores and the publication of that data, this post wouldn't be nearly as in-depth or thorough. Be sure to follow him on Twitter and check his site out for all things Apple Store related. Other information was sourced from Apple's Earnings Reports and Bare Figures (another terrific site).